Audi came to display its artistic flare at the recent 2013 Design Miami/ show in Miami Beach, Florida. At first the synergy between a car maker and one of the worlds leading art and design exhibitions may not be readily apparent. A short explanation may help clarify this relationship. 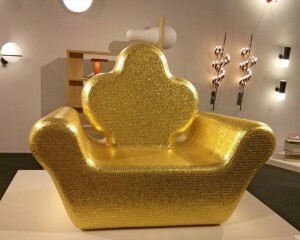 According to the shows organizers, Design Miami/ “brings together the most influential collectors, gallerists, designers, curators and critics from around the world in celebration of design culture and commerce.” The show runs alongside the Art Basel exhibitions that occur in Miami and Basel, Switzerland. Long thought of as the American Riviera, Miami’s unique flare comprised of Hispanic, American and European cultural influences made Miami a natural choice for a show of this calibre. Occurring alongside the Art Basel fairs in Miami, USA each December and Basel, Switzerland each June, Design Miami/ has become the premier venue for collecting, exhibiting, discussing and creating collectible design. 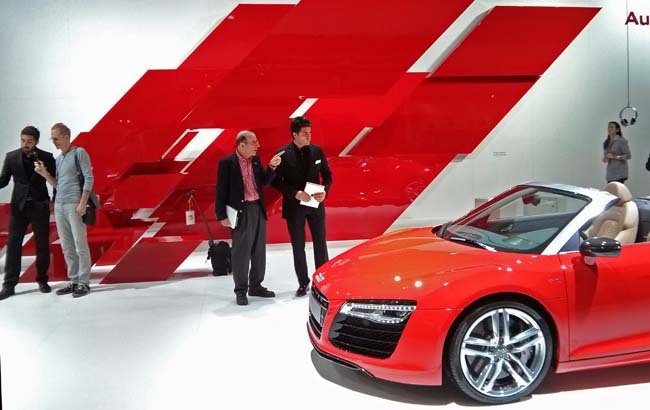 Its status as the per-eminent design exhibition is what attracted Audi to participate and commit as the official automotive sponsor for the event. “source of inspiration that seeks creative dialogue.” Previous Audi installations have been created with the assistance of international designers and architects such as Moritz Waldemeyer, Mirko Borsche, Bjarke Ingels, Clemens Weisshaar and Reed Kram. 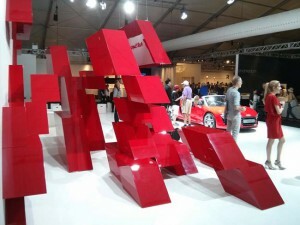 For the 2013 show, Audi Sport created a unique display with its dramatic sculpture, “Fragmentation”. The display is a twist on its iconic red rhombus seen at race tracks around the world. The large floor display featured an exploded version of the Audi Sport logo which projected out from the back wall. Another two dimensional rhombus on an adjoining wall was actually composed of many smaller red vinyl rhomboid stickers. Visitors were encouraged to remove sections and apply then to other stalls around the exhibition hall. 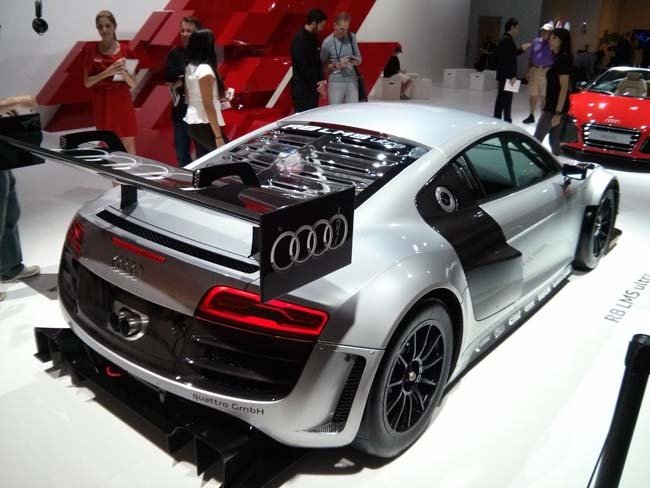 Naturally no automakers exhibit would be complete without a vehicle of some sort and Audi Sport did not disappoint. Laid out were 2 versions of the automakers super car, R8 sports coupe. A red 2014 R8 V10 Spyder sat nosing in towards perhaps the companies most expensive consumer vehicle, the R8 Ultra customer based race car. The standard R8 V10 model sports a 525 horsepower engine, a handful for most licenced drivers. The 2014 Audi LMS R8 Ultra is a purpose built race unit, which is powered by a 570 HP V10 engine. While the 2 R8’s share roughly 50% of their hardware, the strict carbon fibre diet of the professional race car makes it roughly 450 kilos lighter than the V10 coupe you would see at a dealership. Audi has been involved in customer racing since 2009 and sells the LMS R8 Ultra to customers for a shade under $500,000.